Today’s performance-cruisers are faster than ever. But are they going to take care of you in heavy weather in the same way as those pre-IOR boats many of us grew up admiring? Fortunately, there are still builders and designers out there who are willing and able to combine the best of both old and the new in boats like the raised-saloon Tartan 4700. Not so long ago the accommodations aboard the typical cruising boat were the marine equivalent of a sumptuously appointed cave. In recent years, these “caves” have been provided with an abundance of portlights, hatches, windows and lighter finishes to make them less dark and more appealing. But this progress has come at a price—a finish that may be chic, but bears little resemblance to the dreams of oceangoing adventure many of us grew up with. Same goes for performance: today’s performance-cruisers are faster than ever. But are they going to take care of you in heavy weather in the same way as those pre-IOR boats many of us grew up admiring? Fortunately, there are still builders and designers out there who are willing and able to combine the best of both old and the new in boats like the raised-saloon Tartan 4700. Aft, the cockpit has been configured for sailing first and lounging second. 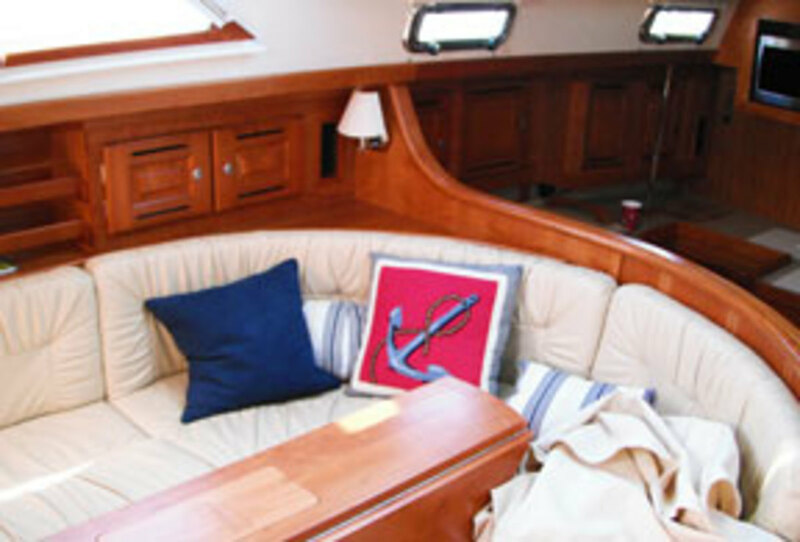 The bench seats are long and correctly proportioned, and there is a small, hinged swim platform in the boat’s shapely reverse transom. Nonetheless, this is a cockpit that encloses and protects the crew from the elements, as a bluewater boat should. 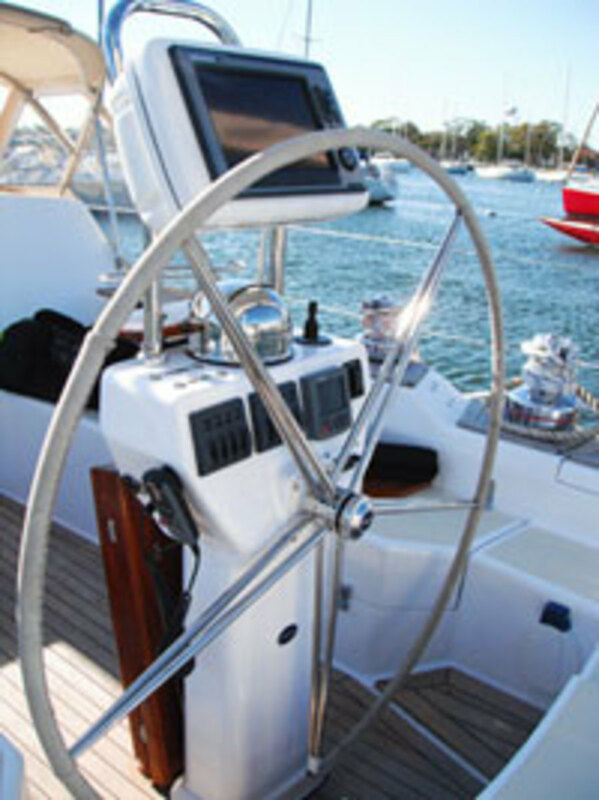 Winches and rope clutches are well placed for both the helmsman and crew, and there are plenty of places to sit or wedge yourself when taking your trick at the wheel. My only real complaint concerns the massive bridgedeck. While it’s going to do a heck of a job keeping water from getting below, it extends so far fore and aft that it’s tough getting down the companionway when the dodger is deployed. Apparently, the dodger on our test boat had an especially low profile, at the owner’s request. But even with a higher dodger, the combination of climbing over the bridgedeck while crouching to keep from banging your head is going to be a challenge—at least for a six-footer like me. Tartan has long incorporated complex angles and an innovative use of space in its accommodations, an approach that works especially well in a raised-saloon boat like the 4700. The massive curved settee embracing the dining table is both a work of art and a great place for hanging out in harbor. I can well imagine killing endless hours here swapping stories on a rainy day, watching the weather through the boat’s huge saloon windows. On a sunny day, these same windows admit all the light you could ever want—a far cry from the caves of yesteryear. The nav station to starboard is one of the most impressive I’ve seen. Not only is the basic table generously proportioned, but the cabinet for the chartplotter is suspended a few inches above the counter extending forward of the nav table, providing a wealth of extra space for spreading out paper charts and other piloting tools. 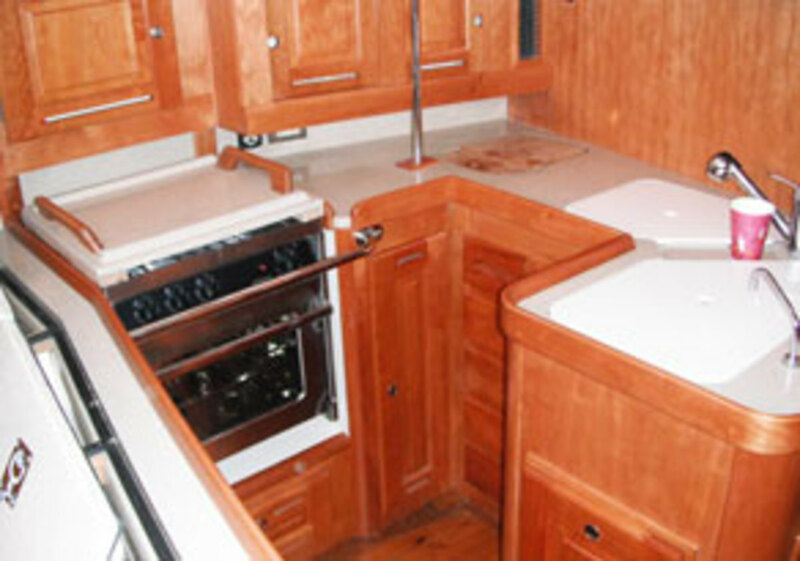 The galley is just forward of the dining area. But while this location is ideal for passing food and drinks to seated guests, serving guests or watch-standers in the cockpit will not be so easy. Natural ventilation also suffers so far from the companionway. A pair of stacked single crew bunks to starboard will make excellent sea berths, complementing the queen-size double berths in the fore and aft staterooms—both of which are large and come with en suite heads. You’ve got to love a nice solid boat when it’s blowing. We had a bright, blustery day on Long Island Sound with gusts over 20 knots for our test sail, and the 4700 absolutely ate it up. She tracked well but still came about without hesitation, and motion through the chop was easy and reassuring at 8-plus knots on a close reach. Gusts didn’t faze the boat at all, even on those occasions when we eased out the main a little too slowly coming out of a gybe. I have no doubt this is a boat that will click off the miles offshore at a good pace, keeping the crew happy and comfortable in the process. Out on the sound, the boat’s optional 110hp Yanmar and three-blade folding Gori prop gave us a speed over ground of 5.4 knots at 2,000 rpm, 6.8 knots at 2,500 rpm and 8.0 knots at 3,000 rpm. Even in the stiff breeze, I had little trouble maneuvering in both forward and reverse in the flat water just offshore. Even so, the bow thruster proved invaluable when grabbing a mooring deep in crowded Mamaroneck Harbor when we were done sailing for the day. Tartan has long gone its own way, marrying a traditional look with first-class build quality. 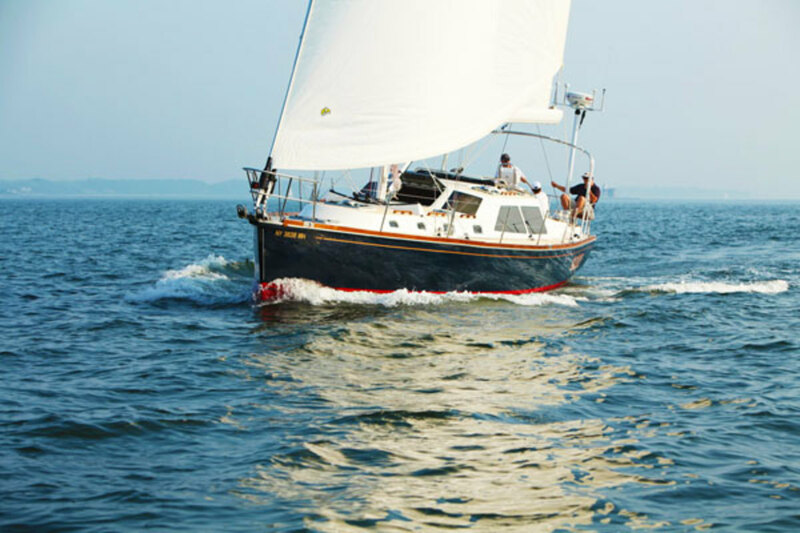 In the 4700, this has once again resulted in a boat that is both beautiful and easy on its crew.